Video from surveillance cameras amplified by online news sites led to the arrests of two people sought by police in recent weeks. One of the incidents took place last Thursday in the western New York community of Batavia, where a camera at a Walmart captured an image of a man who allegedly yelled loudly at a young child and then threw him onto a concrete floor. According to an account in YNN Rochester, state police contacted Howard Owens and asked him to publish a photo in The Batavian, an online news site of which he is the editor and publisher. That night, a 28-year-old man was arrested and charged with endangering the welfare of a child and harassment. Here is Owens’ account of the arraignment. Regardless, it was a coup for The Batavian. The other incident involves a convenience store robbery that took place in New Haven on May 16. Paul Bass, editor and publisher of the New Haven Independent, a nonprofit news site, posted a video clip from the store’s surveillance camera showing an older man calmly showing the clerk a gun and then grabbing cash out of the register. Incredibly, the man’s family saw the story and persuaded the man — described as 57 years old and homeless — to turn himself in. “I’m just a drug addict. I’m just on hard times. My family convinced me to turn myself in,” the man reportedly told police. A day later, police heard from someone who said he and a friend had been robbed by the same man when he approached them on the street. *Update: Owens has posted a comment, and I realize now that I assumed The Daily News had requested the photo and was turned down. In fact, that does not appear to be the case. Through interviews and research, Kennedy shows that local journalism in the 21st Century can survive and thrive so long as those within an organization are willing to put in the work and develop an understanding of the new tenets of journalism: social engagement, deep community focus, and evolving revenue models. Update II: We’ve been moved to Monday, June 3, at 9 a.m. Please tune in. Update: We got postponed to clear time for ongoing coverage of the Connecticut train crash. 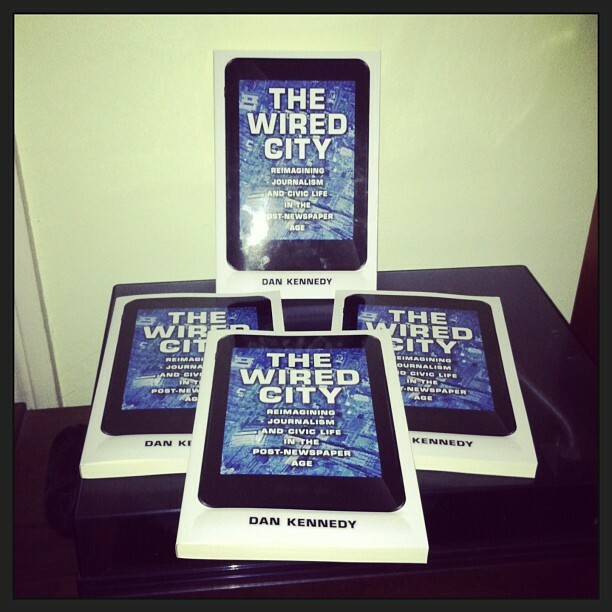 I’ll be doing my first major media event for “The Wired City” on Monday, May 20, at 9 a.m., when I’ll be a guest on Connecticut Public Radio’s “Where We Live,” hosted by John Dankosky. Joining me will be Paul Bass, the founder and editor of the New Haven Independent, a nonprofit online-only news site that is the main subject of my book. If you’re interested, you can listen live online or grab a podcast. This article appeared earlier at The Huffington Post. Outrage over the Internal Revenue Service’s targeting of Tea Party and other right-wing groups continues to boil — yet a potentially more consequential IRS practice has scarcely gained any attention. Over the past few years the IRS has virtually stopped approving 501(c)(3) status for nonprofit news organizations. Given the well-documented decline of traditional for-profit newspapers, nonprofit journalism can be a vital alternative, especially at the local and regional levels. But even when applications for 501(c)(3) status aren’t rejected outright, they are stacking up, unacted upon, for months and even years. There is significant anecdotal evidence that the IRS has delayed the approval of nonprofit media, potentially slowed the development of those already created, and harmed communities by leaving them without essential coverage, due to the application of archaic standards. Starting in the middle part of the last decade, a number of nonprofit entrepreneurs launched community websites that were built roughly on the public radio model, funded by grants, sponsorships and contributions from readers. Gaining 501(c)(3) status allowed donors to make make those contributions tax-exempt. 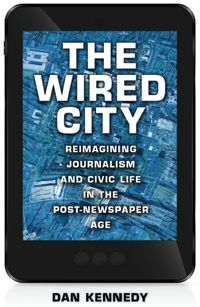 In researching “The Wired City,” my book on the New Haven Independent and other community news sites, I was struck that nearly all of the best-known nonprofits — the Independent, Voice of San Diego, MinnPost, the Texas Tribune, the Connecticut Mirror and others — had been started during the same time period, from 2004 to 2009. “There was an initial bubble of nonprofit start-ups, but you haven’t seen that great wave spreading across the country,” Andrew Donohue, the then-editor of Voice of San Diego, told me in 2011. He saw that as potentially a good thing — a sign that journalists were trying a variety of models, for-profit as well as nonprofit. Since then, however, it has become increasingly apparent that the IRS is a principal agent in stifling that great wave. • In February 2012, the Chicago News Cooperative went under, in part because of its inability to obtain 501(c)(3) status from the IRS, as Ryan Chittum reported in the Columbia Journalism Review. • Because the IRS does not consider journalism to be among the educational activities covered by the 501(c)(3) rules, the agency told the Investigative News Network to remove the word “journalism” from its articles of incorporation. The INN complied and won approval, according to an article about the Council on Foundations report by Justin Ellis of the Nieman Journalism Lab. • In a similar vein, according to the report, the Johnston Insider of Rhode Island received a message from the IRS telling it: “While most of your articles may be of interest to individuals residing in your community, they are not educational.” Because of that and other reasons, editor Elizabeth Wayland-Seal announced that she was suspending publication. What adds to the absurdity of the IRS’s stance, as the report notes, is that we are already accustomed to relying on nonprofit, tax-exempt media for much of our news and information — not just from community news sites but from long-established outlets such as NPR and local public radio stations, “The PBS NewsHour” and magazines such as Mother Jones, Consumer Reports and National Geographic. Nonprofit journalism is not a silver bullet for the future of journalism. But fostering a more diverse media system is. If the IRS decides against allowing nonprofit status for newsrooms, it will essentially be arguing that all journalism should be done for profit. The problem is, the market has shown it will not support the full extent and diversity of news and perspectives we need. Four years ago, U.S. Sen. Ben Cardin, a Maryland Democrat, proposed a bill that would have allowed newspapers to become nonprofit organizations. At the time it struck me as superfluous. Now it appears that it warrants another look — not just for newspapers, but for other forms of media as well. Absent legislation, President Obama should appoint a new IRS commissioner who understands that providing quality local journalism is indeed the sort of educational activity that should be covered by the provisions of 501(c)(3). At a historical moment when it has become increasingly difficult for the traditional media to provide the information we need to govern ourselves in a democracy, the IRS shouldn’t stand in the way of promising alternatives. 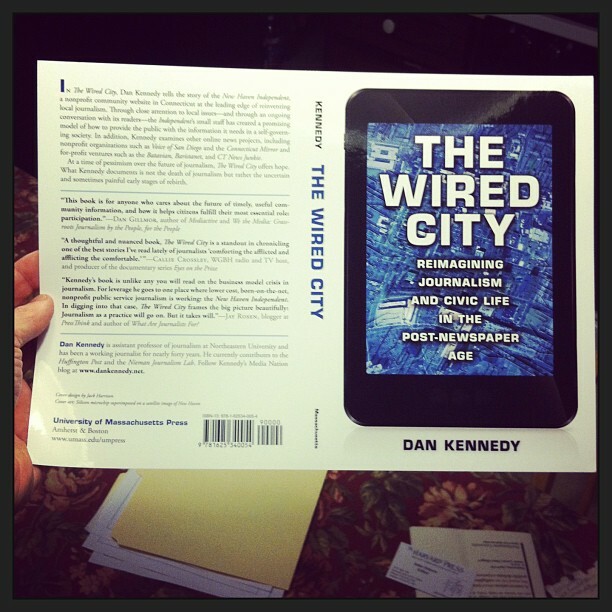 A few copies of the cover arrived in the mail today. The release is scheduled for May 31. I’ve added an Events tab (above) to list upcoming appearances, interviews and the like. It’s a little sparse at the moment, but there’s more in the works — so please stay tuned.